Today, I’ll be reviewing an EP that has come to be one of my favorite Vocaloid releases this year, Wesley Dreamers. 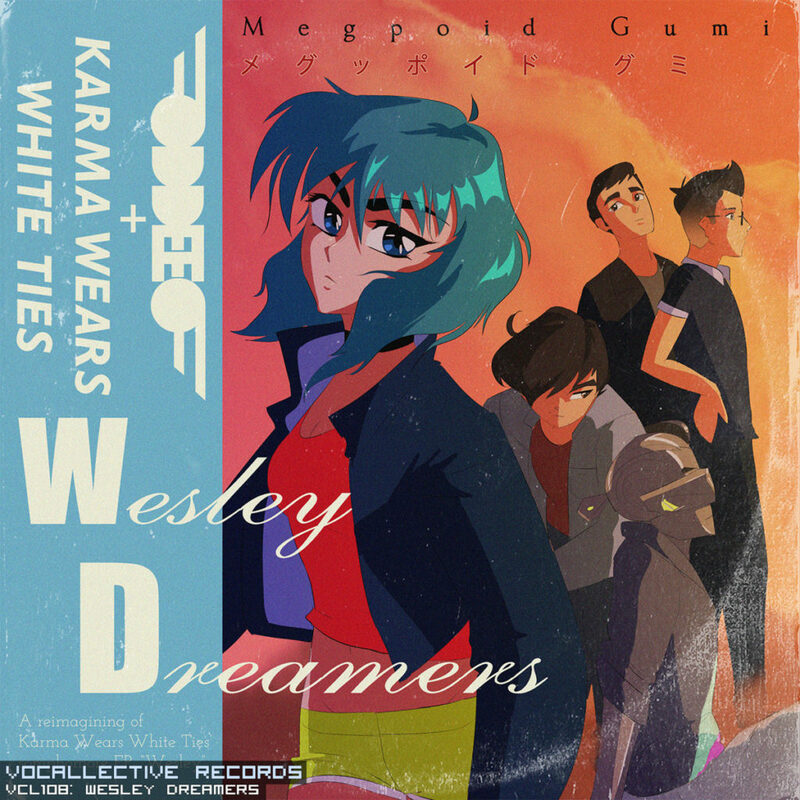 This release is the result of a collaboration between Vocaloid producer ODDEEO, who’s known for retro and electronic music, and indie pop-rock band Karma Wears White Ties. Staying true to its origin as a collab, I think this album displays a blend of vocals (both human and Vocaloid) and styles (retro, post-rock/pop) while maintaining a cohesive sound. You’ll notice quickly that this album uses both Vocaloid and human vocals. While this is nothing new, I’m very pleased with the effect it creates. Using Vocaloid and human singers together can commonly highlight how unnatural (and, at worst, choppy) Vocaloids can sound. This isn’t necessarily a bad thing in itself – I personally don’t think Vocaloids need to sound exactly like humans – but the dichotomy of the two voices can sound strange. In Wesley Dreamers, I think GUMI is given a very natural tone with smooth fluctuations to her voice, causing her to sound more organic even next to the human singer (this all serves to affirm my love of GUMI). Of course the tuning is not perfect, but I think it’s done in a way that narrows the division between the Vocaloid and human sounds enough to let the Vocaloid be taken seriously. The production value of this album is quite good; Karma Wears White Ties has very clean and tight instrumentation. Some of the riffs had a pretty post-rock sound to them, which I enjoy a lot. I’m not sure if ODDEEO had any hand in the instrumentation, but I still got that retro-style feel from the songs, a style similar to some of his previous releases and fortified by the video released for “Chinatown Blues” (linked). With only 5 songs, it’s difficult to choose favorites (let alone least favorites), but “Chinatown Blues” is definitely an earworm for me, and “Polaroid Hues” gives me great vibes. I really like the way GUMI’s voice lingers in the chorus. Overall, I think this is an excellent EP – probably somewhere from an 8 to a 9 out of 10. While it is short, the concision allows it to express its style without getting boring or repetitive. The original version of this EP was Wesley by Karma Wears White Stripes, so be sure to give it a listen as well if you like the music. Linked here. You can purchase Wesley Dreamers on Bandcamp here. For more info look on VocaDB. Thank you for reading! Be sure to leave your comments and suggestions! This entry was posted in Album review, Vocaloid news. Bookmark the permalink.